If you are new to SD540B, please refer to this page for related information, and save this URL for future reference. Download User Guide PDF here. SD540B uses PWM signal to operate the motors, any library (LabVIEW, C++, Java, etc) that provides PWM API will work with SD540B. Power Input and Output terminals are color coded as in picture below. 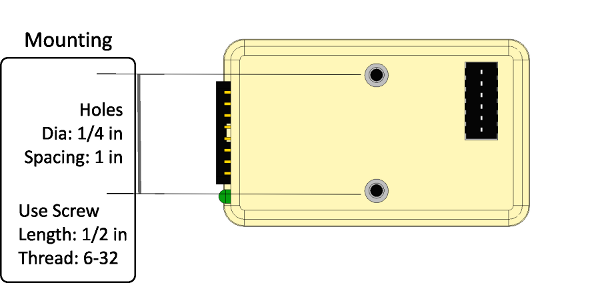 PWM cable attaches on three Top-Left pins as shown in the picture below. There is provision to attach two limit switches, High and Low. Connect them to bottom left pins as in picture above. (Read more about Normally Open vs Normally Closed configuration in DIP switches section below). The SD540B comes with 1/2 inch long screws. There are 6 DIP switches at the bottom of your device. You can use these switches to change behavior of SD540 to get maximum benefit for your robot design. PWM Switch must be set to Position PWM (left). Rev/Fwd Switch will change the direction of the motor rotation, and role of High and Low Limit switches. LimL Switch will change behavior of Low Limit switch from Normally Open to Normally Closed. LimH Switch will change behavior of High Limit switch from Normally Open to Normally Closed. 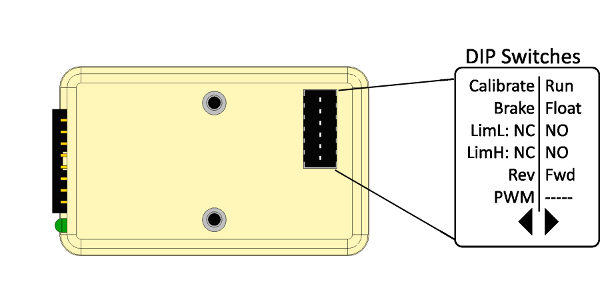 Brake/Float Switch will Brake or Float the motor when stopping. Calibrate/Run Switch for normal operation, keep this switch to Run Position (right). Calibrate Switch can be used to calibrate the PWM signal (if required). Device is calibrated at factory for RoboRIO, so you do not need to calibrate for RoboRIO. If you plan to use with a different controller, write to us for calibration instructions. This LED will turn Red when Power is supplied. This LED turns Red in Forward direction and Green in Reverse direction. This LED turns Red when no valid PWM signal is detected, and turns Green when valid PWM signal is detected.